Want to know how many illegals are voting in U.S. Elections? Up to 3 million. Several groups are calling for a non-partisan federal voter fraud investigation after years of allegations but little action on a national scale. On Nov. 6, Project Veritas recorded on camera alleged electioneering in Georgia, and polling attendants discussing a vast number of non-citizens voting in Texas. Newly re-elected Gov. Greg Abbott announced that his office would look into the matter, stating those who violated the law would be prosecuted. In 2014, professors from Old Dominion University and George Mason University produced a report estimating that about 6.4 percent of non-citizens voted in the 2008 presidential election and that 2.2 percent voted in the 2010 midterm election. They estimated that 80 percent of non-citizen voters cast their ballots in favor of one party, and that their numbers were great enough to have affected the outcome of the election in which they voted. When non-citizens were prohibited from voting, the professors noted, the outcome of the election changed. 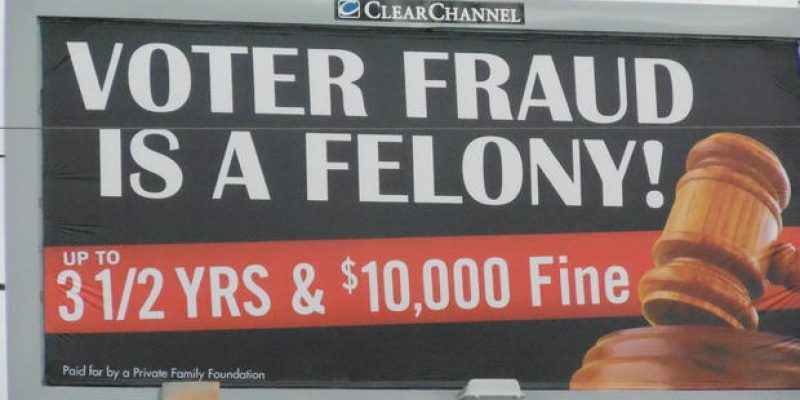 In 2016, the Public Interest Legal Foundation (PILF) filed lawsuits alleging voter fraud in Broward County, Florida, and Wake County, North Carolina. “The Broward County Supervisor of Elections Office violated state and federal laws by destroying ballots from a 2016 Congressional race too soon – and while the ballots were the subject of a lawsuit against the office, a judge has ruled,” The Sun Sentinel reported in May. Broward County is again in the national spotlight after the 2018 midterm elections after Democrats contested the outcome, and after video surfaced by Canova of paper ballots allegedly being transported by a private rental truck, which would be a violation of election law. In its 2016 report that focused on Virginia, PILF found more than 1,000 instances of non-citizens registered to vote in eight Virginia counties who cast nearly 200 ballots in elections. Eight out of 125 counties provided data, indicating the problem “was more widespread than the small sample would indicate,” PILF’s attorney J. Christian Adams, said at the time. In 2016, the U.S. Attorney for the Eastern District of North Carolina announced that 19 foreign nationals were charged with, among other crimes, illegally voting in U.S elections. A 20th defendant was charged with aiding and abetting a fellow defendant in falsely claiming U.S. citizenship in order to register to vote. They faced sentences of between one and 26 years in prison and a combined total of $1.1 million in fines. They were identified during an investigation into non-citizens fraudulently receiving federal benefits. In 2017, Franklin County Prosecutor Ron O’Brien announced that a county grand jury indicted seven foreign nationals on election fraud charges for allegedly voting illegally in the 2012 and 2016 U.S. elections. The National Voter Registration Act of 1993 (NVRA) requires that people registering to vote in federal elections affirm that they are U.S. citizens. Failure to do so is a crime punishable under five federal statutes. Congress attempted to address the issue in 2005 by enacting the Real ID Act, which established standards for state-issued licenses and other identity documents, including verifying immigration status. According to the Department of Homeland Security, only 24 states and territories are in compliance with the law. The U.S. Vote Foundation maintains that many of the states listed as compliant aren’t actually in compliance and continue to issue drivers’ licenses and state ID cards to illegal immigrants and short-term visitors. U.S. Rep. Kevin McCarthy, R-Calif, proposed House Resolution 1071, which was passed by Congress in September 2017, expressing disapproval of non-citizen illegal immigrants voting after the city of San Francisco allowed non-citizens, including illegal immigrants, to register to vote in school board elections. The resolution states, “… allowing illegal immigrants the right to vote devalues the franchise and diminishes the voting power of U.S. citizens. According to the roll call vote, 230 Republicans voted “yes,” Justin Amash of Michigan voted “no,” and four abstained. Among Democrats, 49 voted “yes”, 69 answered “present” and four abstained. A 2015 Rasmussen Reports poll found that 53 percent of Democrats surveyed support illegal immigrants voting in U.S. elections.